We arrived in Delhi this evening after an exhausting 2 and one-half hour van ride down the mountain to Bagdogra and another 2 and one-half hour flight to Delhi. 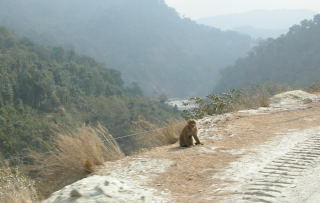 The only reasonably good photo I was able to get from the moving vehicle of the Guardian Monkeys”,who line the side of the highway, waiting for morsels of food. 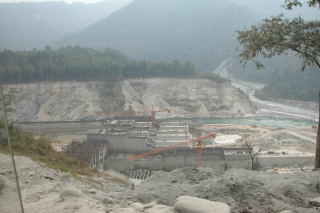 The new dam under construction. It will provide hydro-electric power, but one wonders about the environmental effects down-river. New Delhi is a huge, overpopulated sprawling tangle of humanity, vehicles, and smog. We are staying in the Marina Hotel. The Hotel is on Connaught Place (one of the big circles in Central Delhi). Please see map. Tomorrow, K and I will sleep late and then have a rehearsal with a pianist in preparation for two concerts on Jan. 28th at the Delhi Music School and the American Centre at the American Embassy. Security has been rather tight because the 26th is Republic Day (roughly equivalent to our July 4th). Traditionally, there is a huge parade attended by a million people (as I’ve been told). This year, the guest of honor is Nicolas Sarcosy and his new girlfriend! We won’t be attending the parade for many reasons (safety, for one)! The boys in the string quartet are having quite an experience in Delhi. I don’t think they liked Delhi very much. 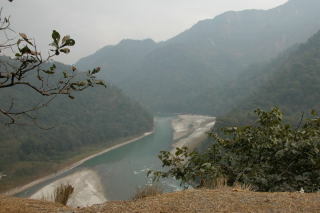 It is quite different than Kalimpong in every respect. In Kalimpong we Americans could walk unimpeded (and almost unnoticed) throughout the town. In Delhi, we were constantly bombarded by outstretched hands begging for money, or were the target of scouts on every street corner offering to lead you the the best shopping areas, where the hard-sell and pressure to buy made for extremely unpleasant window shopping. We only subjected ourselves to this process once! Just think about going up the road for the first time with a young driver who had never driven a car with a turbo-charged engine before (or anything that had more than 60 horsepower). Add to this the philosophy that his death might afford him the only opportunity to rise to a higher caste level in the next life, and you have some very nervous passengers in the back seat! I felt like kissing the asphalt when we got to the Ashram! Way too scary for me. I just want to see you two back home safely. With instruments in hand, I might add. 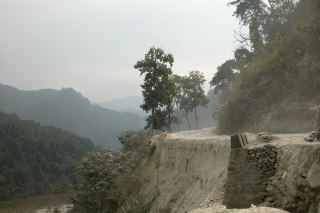 I heartily Thank God for being in the driver’s seat and protecting them on that hazardous trip down the mountain to Bagdogra! Yes, MK, I also just want to see those two, safely back home. And, like you, “with instruments in hand”.